The PEEP Hole Shawl is an easy to make and easy to wear shawl/scarf that’s perfect for gradient mini-skeins. While we used Knitted Wit Gumballs for the finished shawls in the Progressive East End Project (PEEP), any mini-skeins can be used as long as each mini-skein is at least 45 yards. The shawl is 86” long on the longest edge and 14.5” wide at the widest part. 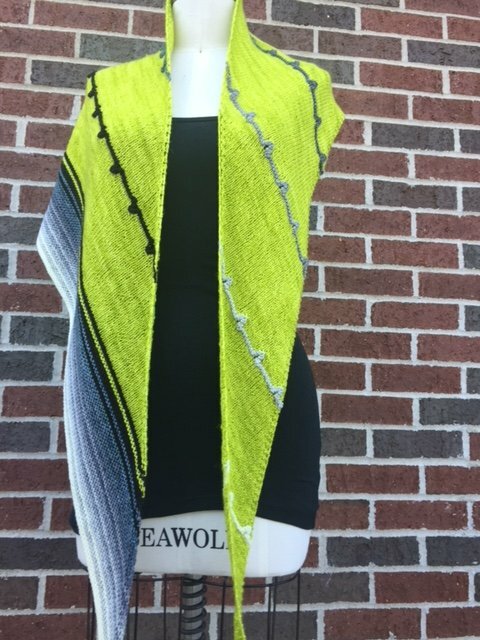 Unfrotunately, there is not an easy way to make the shawl smaller or larger. The gauge is 20 sts & 32 rows per 4” in stockinette stitch. Please do a gauge swatch to insure that your shawl will come out to the dimensions specified above.